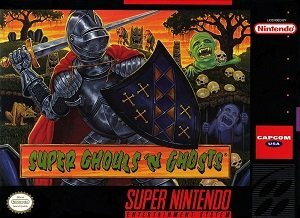 Cheats, Tips, Tricks, Walkthroughs and Secrets for Super Ghouls and Ghosts on the Super Nintendo (SNES) We also have PRO Action replay and game genie codes. Invincibility Glitch – In the second half of stage 5 there is a section where the player must navigate through and avoid a series of avalanches. With the gold armor (there are enough treasure chests to acquire the gold armor by this point) charge Arthur’s magic by holding the “shot” button then approach the first avalanche. Release the button to use Arthur’s magic just before this first avalanche strikes him and Arthur will be invincible for the remainder of the stage! Arthur’s will still have to avoid further avalanches and his shield can still take damage, but Arthur himself cannot. This invincibility will be gone at the beginning of stage 6, but take advantage of this glitch to very easily beat the boss of stage 5! If this glitch is exploited while using the crossbow Arthur will also gain super speed. Level Select – Highlight ”Exit” on the option screen with controller one. Hold L + Start on controller two and press Start on controller one. Stop Enemies Spawning – In various parts of the game enemies can be despawned, which is to say that they can be removed from the player’s path on screen. To despawn an enemy have the enemy in question spawn on screen then retreat until that enemy can no longer be seen. Return to the enemy’s location and the player will notice that it will be gone. This trick is most useful in the auto-scrolling section in the second half of stage 4. In this stage blue balls will appear in complicated locations obstructing the player’s path. However, by running away until they are off-screen the player can return and find that a troublesome ball has disappeared, making a significantly smoother path. While not all enemies can be despawned and while not all despawns are as meaningful as the ones in stage 4 as mentioned above, despawning enemies in this way can make playthroughs far less complicated. Secret Chest – In the first half of stage 4 the player will eventually move to the right to face 2 green skulls, then climb a platforming section resembling a staircase before progressing to the left. With Arthur in gold armor and while using the crossbow weapon, stand at the top of this staircase and use his “Discover” magic (by pressing and holding the shot button) to reveal an otherwise inaccessible treasure chest. As the activation point for this chest is actually in the wall to the right of the chest, using this “Discover” magic is the only possible way to gain access.